You know it’s the first sign of Rhubarb Season – maybe you call it “Spring” – when a New Rhubarb recipe shows up! Rhubarb Crumble Cheesecake Bars! Rhubarb. The misunderstood fruit. I can identify with that. It looks like a vegetable – celery – but we normally cook with it as we do with fruits. Pies, crisps, crumbles. Growing up, we planted rhubarb in our backyard garden. But unlike here in the Pacific Northwest, we didn’t harvest it until mid to late summer. Must’ve been a slightly different variety. Mom couldn’t wait to cook the Tangy-Sweet Ruby Red Stalks stewed in sugar. Then put it into a pie or top with crispy brown sugary goodness! Wow! So much flavor in each bite. I remember the first time I tried rhubarb. Mom had made Rhubarb Pie. I expected it would be like other fruits – sweet from the get-go. But that potent hit of tart blew me away. I was about to say, “I don’t like this!”. But that whoosh of brown-sugar sweetness brought me back to reality. It was amazing! One of my all-time favorite fruits, er…vegetables. So, celebrate Rhubarb Season with me! Make some Rhubarb Crumble Cheesecake Bars! And remember YOUR first taste of this delectable vegetable. 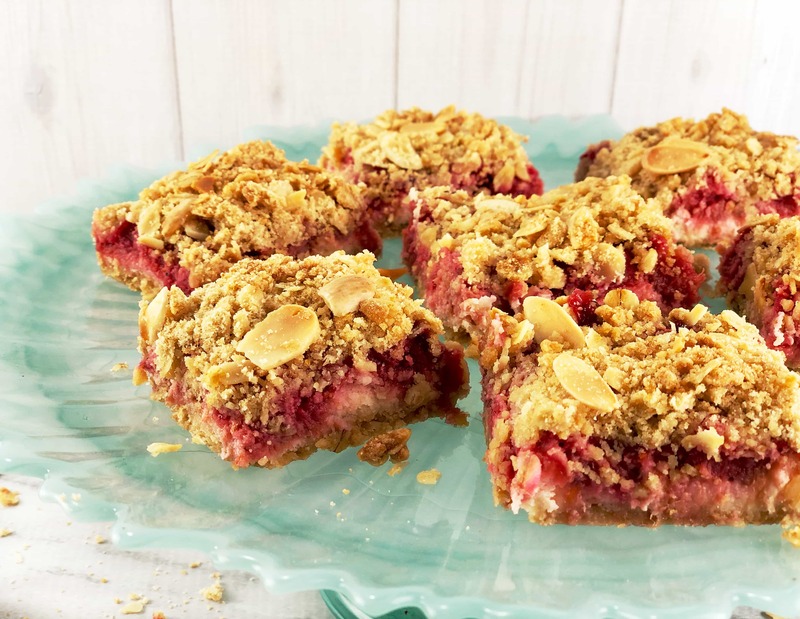 If you like Rhubarb, don’t forget to check out my delectable Rhubarb White Chocolate Blondies, or this easy Strawberry Rhubarb Upside Down Cake, or this classic Fresh Strawberry and Rhubarb Crisp. The perfect Springtime dessert! Layered crispy crust, smooth cream cheese, rhubarb and all topped with more crumble! So delectable! Best made the day before you want to serve them so the bottom crust crisps as it cools. Like many baked goods, the flavors and texture improves the second day. But I totally get it if you want to dig right in! Preheat Conventional oven to 350F, or Convection oven to 335F. Prepare a 13×9 pan by greasing/buttering. If you would like to lift bars neatly out of the pan, place parchment paper so it overhangs edges of the pan. Into a small or medium saucepan over Medium heat, place rhubarb, berries (if using), sugar, and water. Heat, stirring regularly, until the fruits exude much of their water and soften, about 8 minutes. Add the cornstarch, heating and stirring an additional 2 minutes, until the mixture thickens somewhat. Pour into glass or ceramic dish and set aside to cool. Whisk together the softened cream cheese, sifted sugar and the egg until smooth. Set aside. Into a medium bowl, add the softened butter, flour, oats, brown sugar, salt, until crumbly. Pour half of the mixture into the prepared pan, pressing down with your hands until the bottom of the pan is evenly covered all the way to the corners. Add the sliced almonds to the crumble that remains in the bowl and combine. Pour the cream cheese mixture over the bottom crust and spread within 1/4” of the edges. Pour the mostly cooled rhubarb mixture over the cream cheese, spreading it gently so the layers don’t mix too much. Sprinkle the crumble mixture evenly over the top of the fruit mixture. Place in oven for 28-32 minutes, until golden brown. Cool completely before slicing, especially if you like the bottom crust CRISP! It’s ok to store covered, at room temperature, for a day or two. Otherwise, refrigerate. Oh yes ! Love tangy and sweet with crumble on the top ! Perfect seasonal treat ! I agree! Rhubarb and springtime are perfect partners I think! I can’t get enough this time of yea! Thanks for visiting! They look amazing. First time here and loving it! Thanks so much! 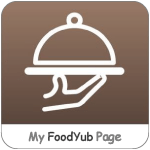 So glad you found us, and hopefully you’ll find many amazingly delicious ideas! I definitely say this counts as a meal! So rhubarb is one of the few things that I have yet to try my hand at in terms of the garden. I’m always so desperate for spring by this time of the year that I suspect I’ll love having rhubarb growing out there! Plus, I do love the tart + sweet combo. These cheesecake bars sound fantastic, Laura! I love that pop of color from the berries! I’m glad, David, that we see nutrition in the same way! Cover the food groups, and you’re golden, right? I’d love to plant some rhubarb, too, but my postage-stamp sized yard tends to object when I try to add too many new things. Hope you get the chance to make these! And, thanks for your visit! What’s not to LOVE about these? All my favourite things in one, they sound so good. Thank you, Caroline! These are all my favorites, too! I love when you can have all the goodness in each bite, don’t you? Thanks, Kim, for your visit and Pin! When I was a kid, I wasn’t a huge fan of rhubarb, but 20 years+ later everything changed as I re-discovered it. Unfortunately, rhubarb in our area isn’t available until June – at least last year they started to sell it that time, and I didn’t have a lot of inspiration by that time. Maybe this year I prepare myself to the late rhubarb season. And these cheesecake bars look and sound fantastic. Rhubarb and cream cheese do go and balance each other out well together. Thanks Ben! I actually think the rhubarb that is ripe in June thru August has a much more robust flavor than the early-ripening variety. I’m going to have to try to get some (it isn’t really available here), and try it in these bars, too! I imagine it’s only better though! I completely agree with your logic Kelsie – there’s hardly a food in the world that isn’t improved by a bit of cream cheese, is there? 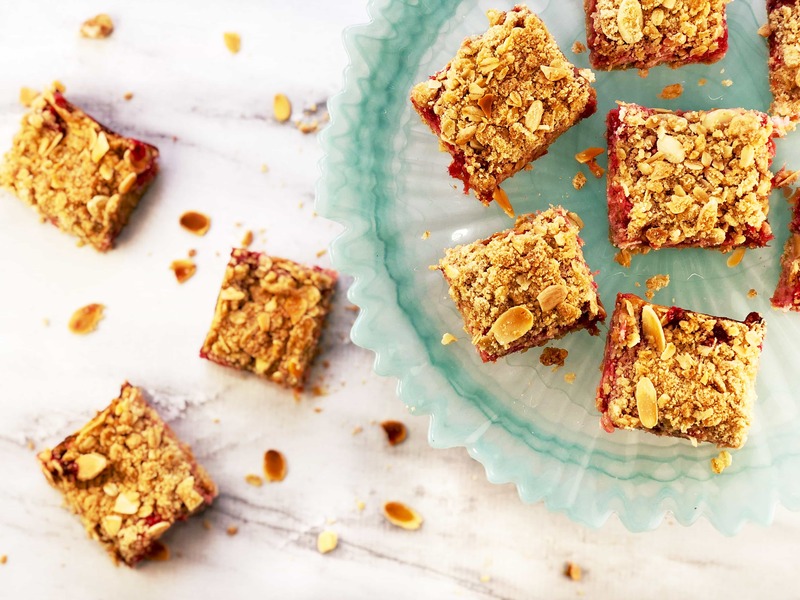 Hope you get the chance to make these bars – totally scrumptious way to use rhubarb! I grew up in Texas and never ate rhubarb but for all I know my mother just might not have like it. My husband on the other hand when he was young had it all the time as a side dish, either that or applesauce. I do enjoy it now and it would make my husband very happy if one of these bars appeared in front of him. Thanks, Karen! Strange how the things we are exposed to as children affect what we eat or not as adults. But these bars are totally worth making when the rhubarb is plentiful, so yummy! This makes me super excited for rhubarb season. We grow in our garden and can’t wait to try these bars. I mean, there’s no going wrong with you have rhubarb + cheesecake!! It’s true, cheesecake anything or rhubarb anything are pretty darn good, so why not combine them? I’m jealous of your garden. Starting to think I should maybe plant some rhubarb, as I love it so much and good rhubarb is difficult to find here. Hmmm. Thanks for your visit, Dawn! Thanks, Neil! There is something special about homegrown rhubarb, isn’t there? I wish I grew it here. Hmmm. Now you’re giving me an idea, since I need more things to do, haha! It’s especially wonderful when attached to the sweetest memories! Thanks for sharing your memory, Neil, and for your kind words! These are made for me, Laura. I love the tang of rhubarb with sweet treats, and I will never say no to anything with cheesecake in the name!! 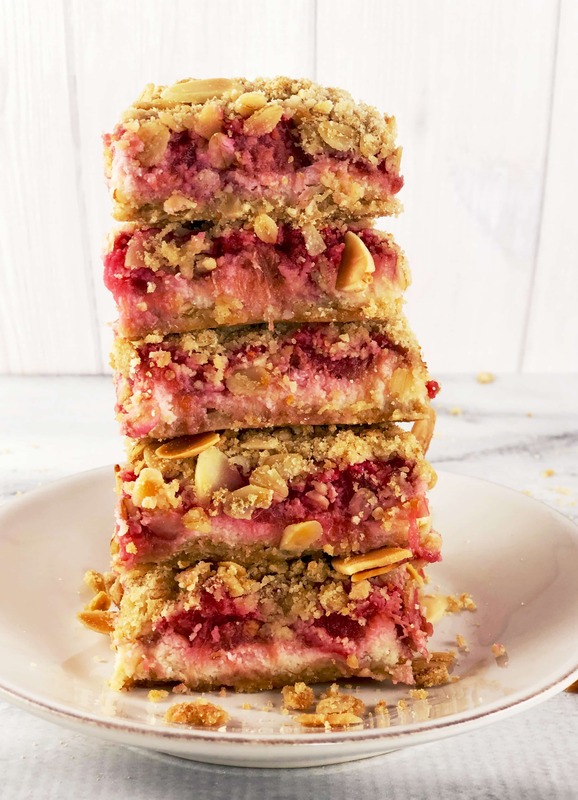 I’m using my first stalks of rhubarb this summer for these bars! Thanks Katherine! I’m so with you, anything cheesecake is totally my jam! It’s pretty awesome with rhubarb, I have to say! So I hope you get the chance to try it out! Yum!! 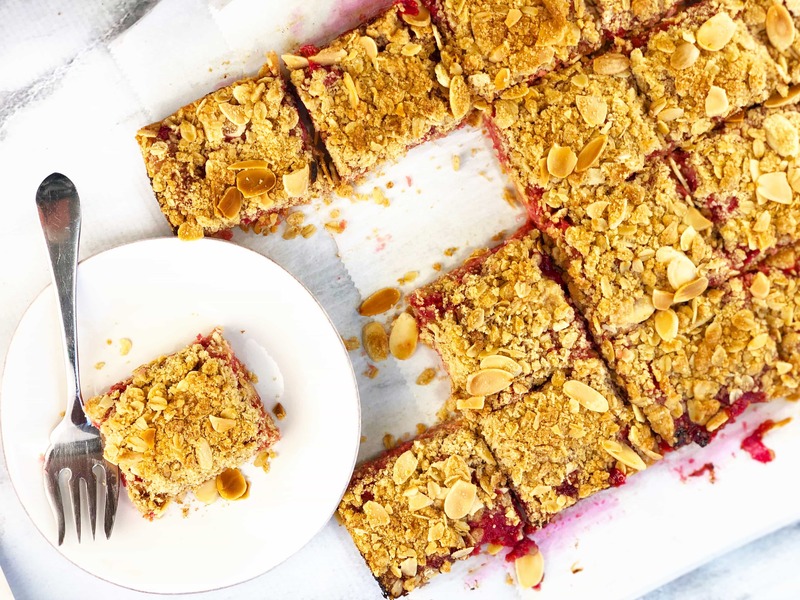 Bring on the rhubarb especially if it’s in the form of these bars! Thanks, Kelly! I agree, rhubarb in any form is good, but you can’t beat a hand-held bar! Thanks for visiting! Great looking rhubarb cheesecake bars Laura. Our rhubarb is just waking up, but in a month or so we’ll be covered up in the stuff. It is indeed a misunderstood veggie. There’re so many different uses for those lovely stalks. Over this way, you’ll find them in desserts and savory dishes. My favorite savory dish is Rhubarb Chicken. Thanks for sharing. Ron! One of my very first posts, before I knew anything about blogging, was Rhubarb Chicken! I loved it! You’ve inspired me (again!). Now I know what I’m making this weekend! Thanks for your visit! And happy cooking with your rhubarb! Laura, this is so pretty. I really love that you added berries to the rhubarb. It’s the only way I really like it. I don’t want too sweet, but I certainly don’t want to pucker up when enjoying a treat! Cheesecake, crumble and rhubarb all in the same bar?? Count me in Laura. These look totally delicious. I still need to get my hands on some rhubarb, but as soon as I do, these need to happen! Thanks, Mary Ann! I’m pretty sure they’ll be happening again soon in my house too!